Happy Thursday!! 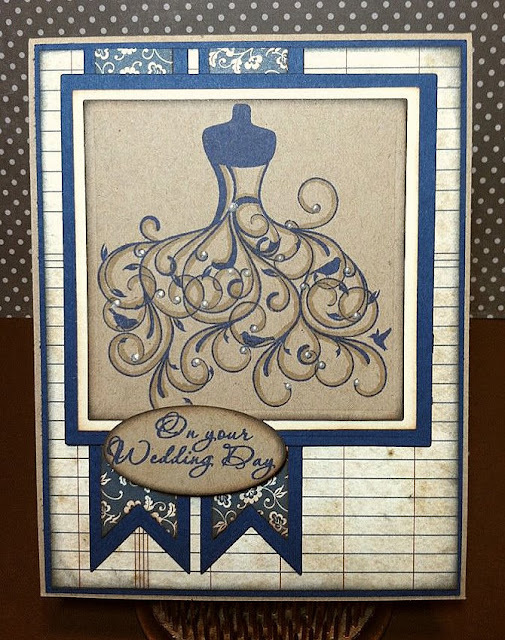 I just LOVE the Wedding Wishes stamp set from Jaded Blossom! I think this wedding dress may be one of my favorite if not my favorite stamp ever! So I've been on a kraft kick lately so I decided to try to create a more rustic looking wedding card. I just love how this wedding dress stamps. I used Paris Dusk (Navy Blue) memento ink and then took a light brown copic marker and created some shadows. The cardstock is Papertrey Ink and the Pattern paper is Echo Park (my favorite!). The flag dies are also from Jaded Blossom. I also stamped On your Wedding day on kraft paper in Paris Dusk. Then added some cream pearl pens as a finishing touch. Beautiful - it looks great on the kraft paper instead of traditional white! absolutely gorgeous! I love this dress stamp!